Within few years of their incorporation, Instagram and Snapchat communities have grown to more than 500 million active users in total. The shift from Facebook or Twitter to clusters such as Snapchat or Instagram has created overwhelming business metrics and into a considerable advertising platforms. Youths are channelizing their energy on these networks that give them vibrant hues about their self-worth and trigger them to find their alike. Many having social stigma are uncloaking themselves to experience the customer-centric features of Insta and Snapchat and consume addictive content throughout the day. In addition, many marketing pundits agreed on the similarities between both the platforms. However, there’s difference between both the networks and it propel the on-going battle to innovate new features to retain their user base and grow more leads. Instagram was launched in October 2010, and within few years, its popularity exploded when Mark Zuckerberg bought it for whopping $1 billion and pumped much money to expand its horizons and to compete with the over growing popularity of Snapchat. Instagram’s active user base will skyrocket from 48.8% to 70% by 2017. Yes, it’s true. The engagement rate has influenced people to jump on Instagram’s bandwagon. Why someone who shares his/her self-generated content, like personal or pics, doesn’t want to have maximum visibility among his friends, theirs and so on? Instagram’s algorithms do that perfectly and in a bigger way than any of other networks in the market. The higher engagement has enticed businesses to focus on this mobile photo-sharing platform for brand building and high-end user growth for their company. Instagram’s popularity has forced businesses to utilize their energy on it and focus on creative juices to take their content in front of the people. Hence, Insta has become a secret recipe for many content marketers and learners to harness the hidden potential and crop various ideas to rejuvenate in the future for fruitful results. The platform has the power to help marketing warm their customers and create an emotional connection between the company and them to sell the products at the later stages. Even if you have created targeted customer persona and generate lots of revolutionary ideas, you will eventually crumble when you fail to drive right people to consume the content. It’s no brainy thing to sell hard to cold customers who are not or least interested in your company. Instagram helps companies to find right kind of audience with 10X more engagement rate than Facebook. Since Instagram is owned by Facebook, it’s easy to manage adverts on the network through Facebook business page. To understand the platform to its core, it’s always better to test one or two elements and weight it to have measurable results. You will understand what works on the platform and what not. That’s how companies like Nike are doing and creating milestones in reaching targeted customers and connecting with the potential leads. Currently valued at $20B, Snapchat paved its way to becoming one of the most popular media sharing applications that got its share of love from the youth who were fascinated about 10 seconds auto- destruction photo feature. Since millennial is contributing heavily to the world economy, Snapchat perfectly targets them. Just for a glimpse, they will hold account of spending $1.4 trillion by 2020, 30% of total retail sales. 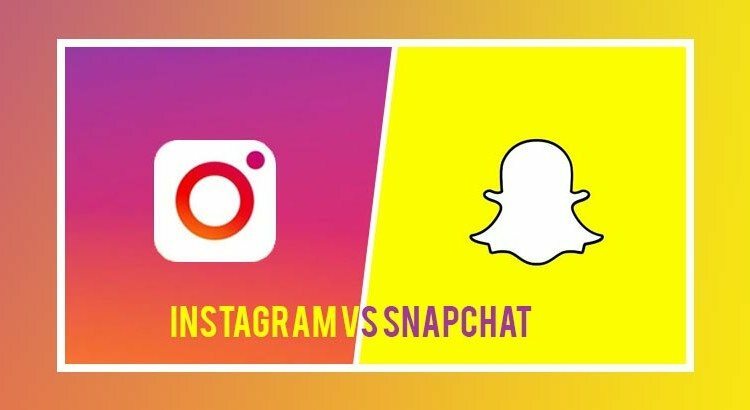 Even though Snapchat is a popular platform, still it has a long way to reach the level of what Facebook, Twitter, and Instagram have become. It doesn’t mean that you start ignoring the fact that Snapchat can be the next big thing because it forced Mark to spend $1 billion and also spent billions on reinventing Instagram to tackle the over growing popularity of Snapchat. Snapchat’s 10-second video story feature created a revolution in the marketing world, and people of different ages, especially, teenagers and youth started their video blog series doing different things to spice up their audience’s interest. Companies like Everlane, General Electric tested the content on short batches and after seeing the result, it wouldn’t be wrong to call it as their defacto marketing platform. Beneath is the infographic made by One Productions that will throw light on the on-going battle between these two channels and which one you should place higher on your priority list according to your business’s nature and strategy.